Showing results for tags 'w204'. I hope my experience with my steering lock issue can help others. I'm driving a W204 and my ESL fault started intermittent where it happen once in every few weeks and after afew in /out of keys, it works normal again. Only last few months where it drive me crazy. It happens almost daily and it took me as long as 10 to 15mins to get it to start. And it worried me that i will never get it start again. So i started doing some research and get some quotes on changing the ESL. The cost of changing the ESL turn me off, singapore workshop charges S$1500 to 1800. Malaysia workshop slightly cheaper RM 3800 to 4000. Youtube teaches on how to DIY, just replace the bloody small DC motor which taobao can buy at RMB30 per pc. But anyway, looks simple but complicated for me. So i drop the idea to DIY. 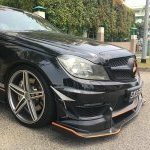 Somehow I was blessed that i come across a bodykit shop owner in permas jaya who recommended me his next shop can do the ESL repair, because he has the same issue like me and has done the repair on his W204. The repair cost RM1500 plus another RM50 for wheel alignment and comes with 3 mths warranty. I considered it very cheap compared to changing a brand new S$1500. But the repair takes 2 days, so i enjoy a 1 night stay in JB. Is been 2 days driving, the ESL is working good and strong. Keeping my finger crossed, hope it solved once and for all. if you dun want to spend a bomb in changing the ESL and want a cheap skate method like me, pm me for the workshop address. If you have one, do PM me. Used W204 C Class car mats. These are genuine AMG mats purchased from C&C previously. No tears, no major stains. Washed once (but can be done better). Sold as-is. Self collect from East. Condition 9.6/10 (cuz its used lolz) $70 take and go. Thanks all. Only for w204. Bought $1500. Selling $500. Plug and play, Easy install and remove. Safest and quickest way to add more hp. Test drive available. contact or sms 94515997 reason for selling: going for stage 1 high boost with ALS remapping. Hi there! Am looking to upgrade my 2008 C200K with some of the facelift model parts from a salvage yard but I am unsure if it'll fit. Seeking suggestions on the compatibility of the following parts. 1) Facelifted rear bumper with diffuser 2) Facelifted LED Side mirrors 3) Facelifted LED tail light Those are the parts I'm looking into, are they perfect fit and compatible? Advice is greatly appreciated! Hi guys, Any good workshop to recommend for repair of steering rack? The "tok" "tok" sound is getting on my nerves. At first tried to bear with it with louder radio but,... Really cannot tahan already. Hey guys, I'm driving a 2014 w204 c180. Sometimes my car is having these 2 issues. Help appreciated. Thanks! 1. Especially when driving up slope, sometimes the car will produce this knocking sound (not sure if its from engine or transmission) for a while till gear shift. Only happen once a while. 2. Sharp jerk when gear change from 2 to 1. Especially when you press on the gas hard on initial and release the pedal. The jerk is quite prominent. Selling at $200. 2pc of made in Thailand Michelin PS4 dated 3016. Used for 9k km. 2pc of made in Spain Michelin PS4 dates 0816. Used for 14k km. Stock 17” rims x 4pcs. Pm to deal. Price neg. Hello. Have a front struct bar that fits W204 for sale. $120.00 contact 9767 8746 now to deal.